The Pro Display Group’s continued support of the hospitality industry shows for itself most notably on high-profile projects such as the work recently done with hotel giant Novotel. As the market evolves, designers are finding new ways for technology to solve a number of challenges traditionally faced, making the best use of space available in the name of efficiency without compromising on style and comfort. Hotel technology tends to have a great propensity to offer comfort and style whilst offering the ideal of efficiency, culminating in the ability to provide well-rounded accommodation that makes the customer feel considered and comfortable. A great example of this is demonstrated in the way the industry has adopted and responded to Switchable technology from Intelligent Glass; a special glass or film based solution that serves a variety of functions, from privacy to projection, changing state from frosted to clear at the press of a button. 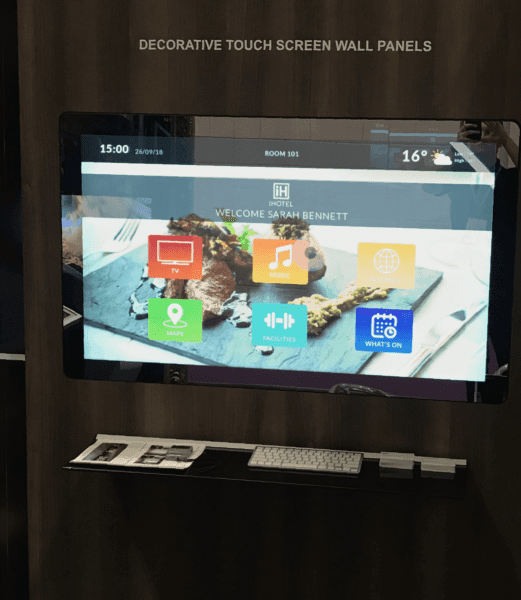 Likewise, Mirror Screen technology from Pro Display has seen a huge degree of interest from the hospitality industry, being able to solve at least 2 separate requirements stylishly in one solution. Novotel, who are well known for their innovative approach to design, offer guests at their Heathrow Airport branch (T1 T2 and T3) a technologically augmented stay through the use of inventive solutions from The Pro Display Group that sets them apart from the competition. Enjoying a reputation in the industry for innovation in design and practicality requires a keen eye on the pulse of what is stylish not only in terms of design, but also in terms of practicality and efficiency. So it stands to reason that an investment in an incredibly innovative use of technology would reinforce this reputation and help with their business objectives, as well as how their customers perceive them. One of the main investments Novotel made was in Laminated Switchable Glass, a complete privacy solution from Intelligent Glass that integrates Switchable technology into safety glass in 136 rooms of the illustrious branch. The Laminated Switchable Glass installations were a versatile and awe-inspiring solution to shower / bathroom privacy; this glass option is ideal for high traffic areas, bathrooms, hospitals and it is even suitable for video projection, offering heightened safety and security compared to alternative glass options in a way that could otherwise represent a health and safety risk. The way Novotel used this technology offers customers controllable and stylish privacy that still allows ambient light from the bedroom to spill into the bathroom. Installed as a room dividing partition, designers were able to maximise the benefits of the space by facilitating a luxury ‘wet room’ area for the shower without blocking light from the rest of the room, creating an open and bright feel in a space that may otherwise feel dark and small when using traditional wall solutions. Installing this wet room partition in line with the exterior windows allows guests to benefit from a degree of natural daylight even when the glass is switched to frosted – a design decision that truly excels in an environment with limited space and where traditionally, guests are used to a small, closed off showering environment that is exclusively lit using artificial light. In opting for Switchable Glass to divide this room, guests are given additional control over their environment, encouraging feelings of comfort, safety and power over the space; feelings that are important to customers hoping for an experiential and stylish stay. 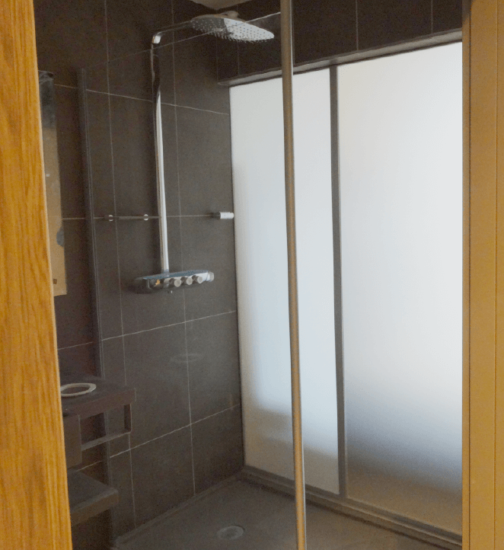 The solution offers guests optional privacy during their shower and time in the bathroom, allowing a degree of choice over their privacy depending on how they feel or who they are staying in the room with. Indeed, such a solution could offer a fun and unique experience for those wishing to use it to its fullest effect. But it doesn’t stop there. Novotel’s investment in Switchable technology is further distinguished due to its incredible versatility, potentially futureproofing the design of the room to ensure that it remains cutting edge and keeps up with luxury expectations from customers. For example, Switchable technology can be easily integrated into home control and automation power systems such as voice activation or smart phone app control. Intelligent Glass have developed such a solution in the form of Voice Activated Switchable Glass that uses a virtual assistant rather than remote control to activate the product, and Novotel would be able to implement this activation method retrospectively with relative ease, turning this already marvellous solution into something truly extraordinary. Likewise, if they wanted to take this screen to the next level of brilliance, they would be able to easily augment the partition with rear projection functionality, allowing guests to watch chosen content whilst showering, or depending on where the projector was installed, hosting the picture on the other side facing into the room, diminishing the need for a TV in the room altogether. Switchable technology offers hotels a solid privacy solution that can be installed in exterior windows, glass partitions or even glass door panels. Its versatility offers extended functionality that ensures this technological marvel can keep on giving long after its initial installation, offering added value when required in this rapidly evolving climate. Perfectly complimenting Novotel’s reputation for luxury design and innovation, Switchable technology in any form can bring so much to a hotel environment that helps reassure customers that they are in a premium, cutting-edge space. Of course, more is to be expected in other areas of the hotel, with the reception / foyer area being a top priority when it comes to matching expectations of the rooms ahead. Often, hotel establishments will invest a considerable amount into their lobby areas in the hope that customers are inspired and drawn in by the pleasant environment they see on entry. 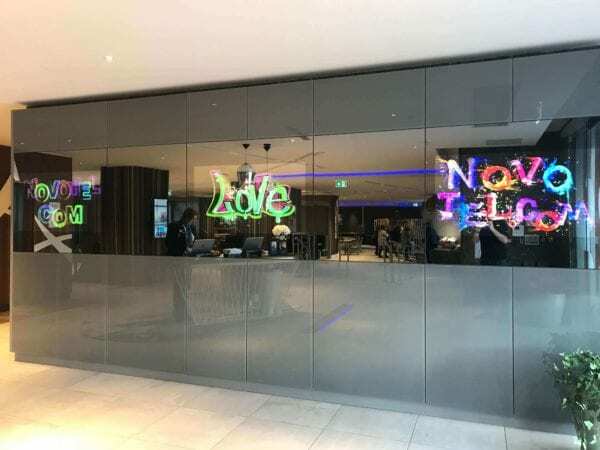 Novotel took this expectation and excelled it, installing an incredibly striking Mirrored Video Wall that sees guests and visitors alike doubletake when presented with the awe inspiring installation before them. Comprising of 3 individual screens, this Mirrored Video Wall comes together to produce a visual marvel that any hotel lobby would be proud of. Ideal for reinforcing branding, communicating information about offers or advertising hotel facilities, this Mirrored Video Wall is used for a variety of applications by Novotel. Situated in their Heathrow Airport T1, T2 & T3 branch lobby, this installation was designed in a way to maximise the use of space, making the most out of high impact digital signage screens in a central position. Novotel were able to reﬂect their high ambient light and premium interior design theme using the highly reﬂective mirrored surface, whilst keeping this area productive. But it’s not just lobby areas that can benefit from such impressive hotel technology, taking us back into hotel rooms or even more exotically in elevators and corridors, Mirror Screen technology can come in the form of Mirror Advertising Screens or, possibly more intriguing for the market, Mirror TVs / Mirror TV Overlays, which combines the reflectivity of a mirror with a TV. 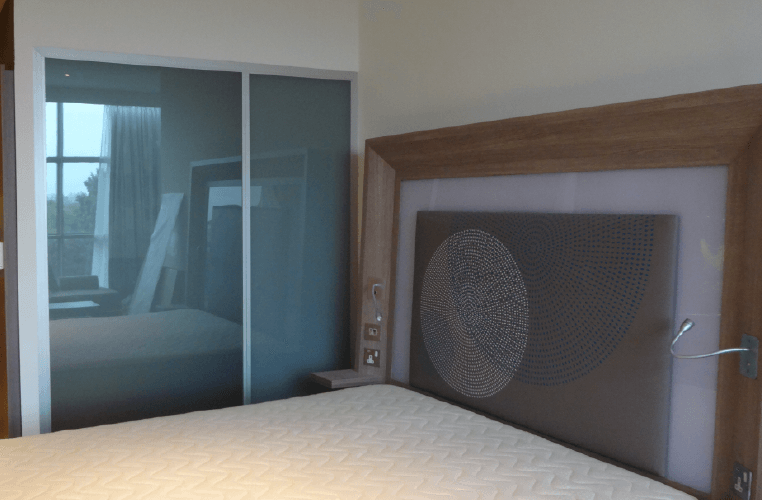 The potential use of Mirror Screen technology in hotels is extremely versatile, allowing designers to integrate screens into mirrors without compromising on space at the same time as impressing guests with a technological marvel they are unlikely to have seen often, if ever. 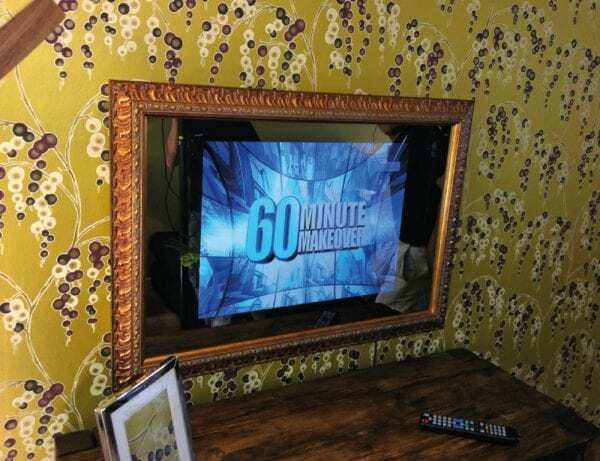 Technology like this easily allows for integration of TVs into space limited areas such as bathrooms, where mirrors are plentiful and to be expected, offering an additional luxury touch. Making this technology even more rewarding, it too can easily be integrated into a smart room environment with the use of network plugs, virtual assistants or voice activation systems for example. Moreover, the use of a product such as Pro Display’s Decorative Mirror Touch Screen Wall Panel offers designers the option of a fully integrated interactive room control panel, offering guests a central entertainment and information hub in the room which could potentially provide guests with incredible control over the room, such as temperature, air conditioning and even lights, not to mention smart TV functions such as browser and network capability or even a bespoke offering of information regarding local amenities, places of interest or information regarding the hotel – an ideal technology solution to augment a stay in a new area.